Although you've probably heard or read various accounts in the popular media, the actual number of US nuclear weapons after 1961 is classified information. 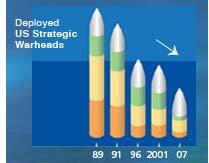 The illustration at right indicates only the relative sizes of the US stockpile since 1989. The stockpile size for 2007 is estimated based on current START agreements. Under the recent Treaty of Moscow (SORT, 5/24/2002), the numbers of deployed strategic warheads will be reduced to 1700 - 2200 by 2012. Through the decades, the role of nuclear weapons in US defense strategy has remained unchanged: they provide the ultimate deterrent against aggression. However, most everything else has changed: the number of weapons in the stockpile is decreasing; the average age of those weapons is increasing; and the size of the weapons complex has been shrinking. The Nuclear Arms Race: Have We Crossed the Finish Line? The US and USSR nuclear stockpiles grew from a single US bomb in 1945 to a destructive power beyond imagination at the height of the Cold War. Seeking to limit the growing numbers of weapons, the US first suggested arms-control talks in 1964. Since then, through a series of agreements, the US and Russia have dramatically reduced their nuclear arsenals. Both nations are committed to making further reductions, and they are cooperating to verify that retired weapons are dismantled and nuclear materials are secured. For the foreseeable future, however, both the US and Russia, along with other nations, still see the need to maintain some level of nuclear deterrent.